While Viswanathan Anand (India), Magnus Carlsen (Norway) and Veselin Topalov (Bulgaria) have played in a number of tournaments together, the Nanjing International will be the first recorded tournament where three players with 2800 FIDE ratings will compete. This tournament is in its third edition and features six strong Grandmasters. Rounding out the field will be Wang Yue (China), Vugar Gashimov (Azerbaijan) and Etienne Bacrot (France). The tournament will be held from October 19th to October 30th in Nanjing, China. It will be a 10-round double round-robin event. Round one will start tomorrow. Incredible NONTRADITIONAL play by Wang Yue !!! I wouldnt be surprised if he took first place, in spite of their old rating system. Its clear the United States have a big advantage over the rest of the world ,actually you can go to their traditional sites to read the old analysis and its clear they seem to be strugglin to explain the HORSEMOVES strategically , they give a few general comments about the position and use their traditional machines to evaluate or help them with their novelties. When i get a chance Um gunna switch over to Susan Polgar’s site to get a feminine perspective on these games ,according to their traditions they think women are weaker in chess ya know? But i think chess is so easy even Simba can do it! ( oh, thats her new puppy) i seen him in a simul on her site, hehe. Anyone doing analysis here? Peace. 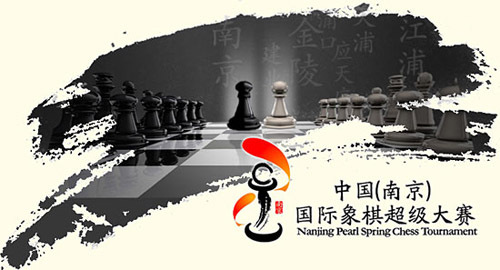 Round Two of the Nanjing Pearl Spring Tournament. Photo by Yu Feng. Fully annotated games by GM Anish Giri! on 22 Oct 2010 at 12:22 am4 Dr. Shearwood "Woody" McClelland III, M.D. Don’t forget that Aronian could become the official world #1 on the November list…he’s now over 2800 after beating Ivanchuk in Bulgaria. I’m aware. That discussion is on several blogs. We are at the point in time where the today’s 2800 is 2700 of 15-20 years ago. Not long ago, there were three 2700s and we used to think of that level as astronomical. Three decisive games today… race tightens for highest FIDE rating! on 22 Oct 2010 at 9:18 am7 Dr. Shearwood "Woody" McClelland III, M.D. That’s because the 2800s of today are all better than the 2700s of 20 years ago…unless you seriously think that Yusupov (who was #3 behind Kasparov and Karpov) is in the league with someone like Carlsen or Aronian. Its the same reason why someone like Kobe Bryant 2009 is better than Jerry West 1969…the speed of the game and athleticism are at a different level today (just like the level of preparation and use of computers makes top-level chess much stronger today). There are only a few in either game that transcend this (Kasparov in chess, Jordan and Chamberlain in basketball are good examples). Agreed. The players of today use powerful tools plus they have access to every game almost instantly. In addition, they can reflect on the games of their predecessors. I believe there will always be debates of whether players from previous eras could compete. This is never a clean debate since it’s difficult to compare across eras, but we do have more strong players than we did 20 years ago. People talk about rating inflation, but in my view, players have simply gotten stronger. those comparisons i believe they dont work. its like saying mothers of today are better at raising children than mothers in the 1st century. the bottom line is we are alive today because the mothers of the 1st century did raise us well same as chess the champions of today are there simply because of the past legend players. You’re right on mothering. Mothering of course, is something entirely different and based, in large part, on instinctive social factors. However, in chess we know that knowledge has a cumulative effect and the strongest chess players today have a variety of tools for an efficient means of information gathering and utilization. In the Fischer era, they relied on old books, the Informant and magazines that came out every month or bimonthly. I believe the Informant was twice a year. Fischer happened to do his own analysis and had kept voluminous records of his work. He also read Soviet magazines. HOWEVER… while it is quite possible that a top ten player of today may have more cumulative chess knowledge than Fischer, it is fair to assess players relative to their own peers (when everyone had the similar access to knowledge). Fischer was of course ahead of his peers by a lot further margin than most other champions. Even Kasparov has admitted this in his interviews. In addition, there are so many other factors in the present era that did not exist in the Fischer era and vice versa. What made Kasparov and Fischer great was not merely their chess knowledge, but their chess personalities. Both were relentless assassins and perfectionists who made very few errors. Few players today have been able to reach their level of intensity, charisma and winning attitude… not Anand, not Topalov, not Carlsen, not Kramnik. However, each of these players today have benefited from the lessons of Fischer and Kasparov. I would say in general that we have stronger players today, but in terms of contributions, Fischer and Kasparov are unparalleled. Fischer perhaps did the most in popularize the image of chess worldwide. I enjoyed Lubomir “Lubosh” Kavalek’s analysis of Topalov-Anand featured on ChessBase today. He gives a preface to his analysis by lauding Anand as a “class act”. I don’t believe many will argue with this. He also mentioned that Anand had won the championship in various formats. Also true. 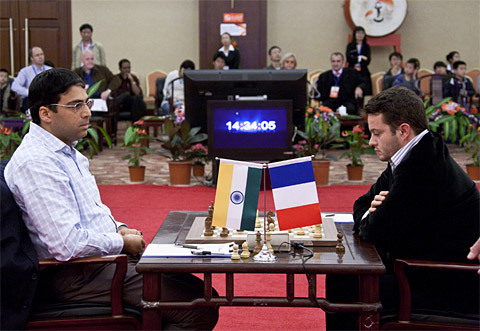 Anand is certainly good for chess and we are fortunate to have him as champion at this time. Bacrot (right) enroute to beating the World Champion. Nice report and photos at Chessvibes! It appears as if Carlsen is back on form. I heard comments elsewhere that he was spending late nights playing poker in Bilbao, Spain and was punished for it. It appears that he focus is back. Great job on the videos by two colleagues, Macauley and Peter! Can carlsen top 2900 by end next year??????? In my view, it’s not possible now. There are not rating points in the pool to extract from. As his rating increases, every time he gets a draw he will lose considerable ground. Are you thinking he can continue an incline for the whole year. He is at 2800 now. One-hundred ELO points in one year is asking a bit much. I believe another question is whether he will remain consistent and keep his 2800 ELO by the end of this year. Carlsen beats Topalov, wins Pearl Spring! It’s time to revisit the debate. It may be that the 2800s of today know more than the 2700s of the past, but whether their play is of higher quality is another issue. There were a lot of blunders in this tournament. on 30 Oct 2010 at 12:06 am22 Dr. Shearwood "Woody" McClelland III, M.D. There are a lot of blunders in EVERY tournament…even the super-GM tourneys. The winner will make the fewest mistakes — not no mistakes. That’s the way it has always been. That being said, there are very few 2700s from the 80s-90s in the league with the top 5 players of today. Anand, Kramnik and Topalov are better now than they were in the 90s, and other than Kasparov and Karpov, no other top player from that era is as good as the top players now. Congrats to Carlsen…he continues to prove he is the real deal. People are so prone to overreaction — he had a bad stretch of 15 games (during which he still beat Jakovenko and Shirov, BTW), but is clearly now back on course. The Candidates in April 2011 will be fun. Also looking forward to seeing Hikaru’s games at the Tal Memorial in a few weeks. I’m not talking about simple mistakes, but gross blunders like losing pieces (Bacrot) and dropping pawns to one move tactics (like Topalov against Carlsen). I’m strong enough to know the difference. Anand was completely lost against Carlsen when the latter missed a clear win. The move was, “Carlsen moves, Anand resigns”. Carlsen missed it and Anand drew. These are 2800-level players. Again… I believe the players of today have more information, but it’s hard to compare players of different eras. As I think about this more, there is no way of keeping everything static and comparing. For example you cannot take a 1975 Karpov and match with a 2006 Kramnik. It’s not even an accurate comparison. Kramnik has more information and more resources than a 1975 Karpov. How do you say one is better? There is no definitive way. The only way is to do a content analysis of the games. If you did that you may find Fischer, Karpov and Kasparov were much more consistent in their levels. Neither Anand, Kramnik, nor Topalov have shown the consistency of the previous champions. I remember Kramnik missing a mate in one and I don’t remember Fischer, Karpov or Kasparov ever doing this. Players now seem to blunder more because they rely so heavily on computers. They are not as cautious as when players had to rely on their own analysis. on 30 Oct 2010 at 11:55 am24 Dr. Shearwood "Woody" McClelland III, M.D. Kasparov made startling blunders as well…we just don’t remember them. He resigned in a clearly drawn position during one of his super-GM tournaments while he was world champ. Also the end of the Kasparov-Karpov 1987 match was filled with blunders — plus who can forget the final Deep Blue-Kasparov 1997 game — that was about as bad as missing a mate-in-one. Karpov’s strength was never his opening analysis, while that is one of Kramnik’s strengths — as he showed in taking the title from Kasparov without losing once in their 15 game match!! BTW, 1975 Karpov wasn’t even the best or highest-rated player in the world…as we all know. Kasparov is the most versatile player ever, which is why he remained dominant for so long and why to me he is GOAT. During much of Karpov’s era of dominance (1975-1985) his rivals were not as strong as Kasparov’s (obviously, b/c Karpov was still in his prime when Kasparov first became champion, while Karpov never had to play Fischer or anyone as strong as Anand during his prime) which is why he was able dominate his era — no way is prime Korchnoi or postprime Tal superior to Anand or Kramnik. I seriously doubt that prime Korchnoi is superior to even prime Ivanchuk, BTW. A good analogy is in tennis…Pete Sampras may have been #1 more weeks than Federer, but that’s because he never faced anyone as good as Nadal in his era (not even Agassi). It’s not just how long someone remains dominant, its about the level of their competition in doing so. This makes Anand already one of the top 5-7 players of all time — I don’t think he’ll ever top Kasparov, but he could reach #2 all-time if he wins in 2012 and 2014. The Deep Blue game was an opening disaster, but we certainly can pick occasions where Kasparov blundered. There is a famous video with one of his blunders against Anand. What I’m saying is the frequency in which players are blundering these days appears much higher than before. There is so much to try to remember. When you have GMs who cannot win in Q vs. R endgames and hanging clear rooks (one top GM did this twice in a matter of months), something has gone wrong. Kramnik missing mate-in-one is probably the worst of a championship-level player… worst than Petrosian overlooking his queen in a dominating position. Again… comparing any players from different eras is problematic unless you have a time capsule. One thing for sure prime Korchnoi was certainly much more stable than prime Ivanchuk. He still plays at a good level. You say Korchnoi is not as strong, but there is no way to assess this since Ivanchuk has the benefit of all the games that happened since Korchnoi’s prime. 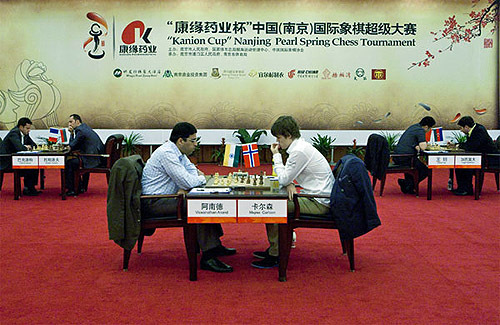 Carlsen, Anand, Bacrot 1-2-3 in Nanjing. ChessBase reports Zierk got a GM norm a round in advance. I thought he had to play three GMs for the norm and only got it in the last round.